I’ve made passing reference to a startup called JumpPost on this site, I’ve posted my status as JumpPost co-founder to the internets, and I’ve been shamelessly plugging away at everyone I know to give JumpPost a try for the past few weeks. I figure it’s about high-time to explain what exactly JumpPost is. Renting an apartment in New York City is hard. JumpPost makes it easier by allowing you to browse, view, and apply for apartments that have never been accessible in the market before – apartments that will be coming up for rent months in advance. 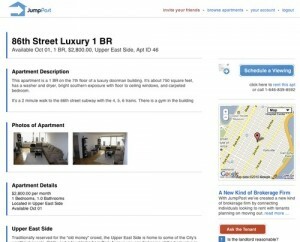 Not only that, but if you’re planning to move out of an NYC apartment that you’re renting, you can make $500+ through JumpPost simply by listing it on the site. If someone wants to rent it, you earn money. 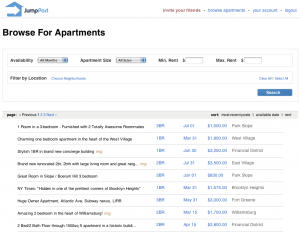 The NYC apartment hunt has always been an inefficiency that has affected me directly. It’s wrought with expensive fees, lying brokers, craigslist bait-and-switch offers, and the necessity to collateralize your first born child to prove your worthiness to rent. It’s always been a problem I’ve wanted to help solve, and that’s why a couple months ago I jumped at the chance to join Jordan Cooper as co-founder at JumpPost. If I were from Boston I’d probably describe Jordan as “wicked-smart”, or if I were from Northern California I’d probably describe him as “hella-smart”, but since I’m from New York I’ll just tell it like it is: the man’s got vision, creativity, intellectual prowess, and he’s unwilling to see this thing fail. All qualities I was looking for in a co-founder. I’m super pumped to be working with him on JumpPost, which he had been plugging away at for a few months before I hopped on board. There’ll likely be much more to come, re: JumpPost, on this site in the coming months, but for now if you’d like to learn more check out the site, or drop me an email at petkanics@gmail.com. As you’d expect, we’ve released early and are iterating quickly, so what you see now might not be what you see tomorrow or next week. 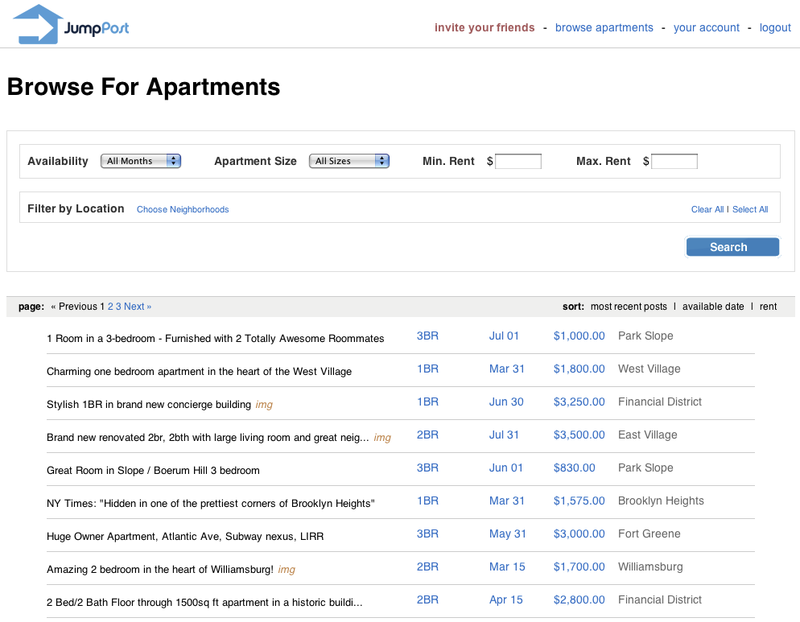 If you know people living in NYC apartments you can even invite them to post the apartment on the site through our invite tool, and you’ll earn $100 if their apartment rents. Posted on March 25, 2010 by petkanics. This entry was tagged JumpPost. Bookmark the permalink.